The first Christmas we were dating, my husband spent the holidays with my family and made Janssons frestelse as his contribution to the Christmas Eve meal. 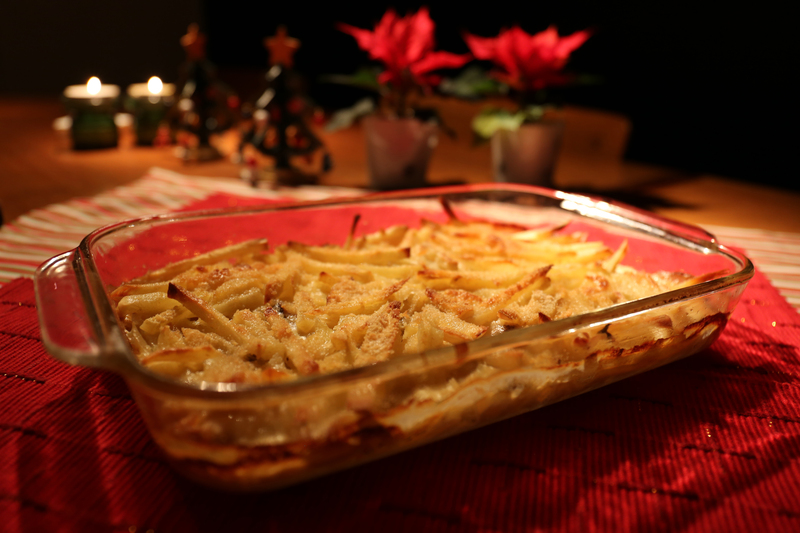 Translated at Jansson’s Temptation, the casserole of julienned potatoes, onions, pickled sprats, and cream is standard fare for the Swedish julbord (Christmas table). The idea of fish layered with potatoes can be a bit foreign, so I was really surprised how well my family received it, and how much I liked it too. Fondly referred to as “fishy potatoes,” my family looks forward to having this whenever we visit for Christmas. It’s a bit of work to make if you don’t have a mandolin, but it’s worth the effort. The potatoes can be grated in a food processor, but in my opinion that changes the consistency substantially and it’s worth doing the work to julienne by hand or mandolin. The origin of the name is up for debate as to whether it’s named after the gourmand opera singer Pelle Janzon, or the 1928 film Janssons Frestelse. Regardless, the recipe was first published in the 1940s and has become an expected dish to appear on the julbord. It’s also a festive dish that turns up at momentous occasions such as weddings. However, it was a bit too much for me to take when they busted out the Janssons at midnight at an August Swedish wedding. I prefer it as part of the julbord in the dark and cold Swedish winter. 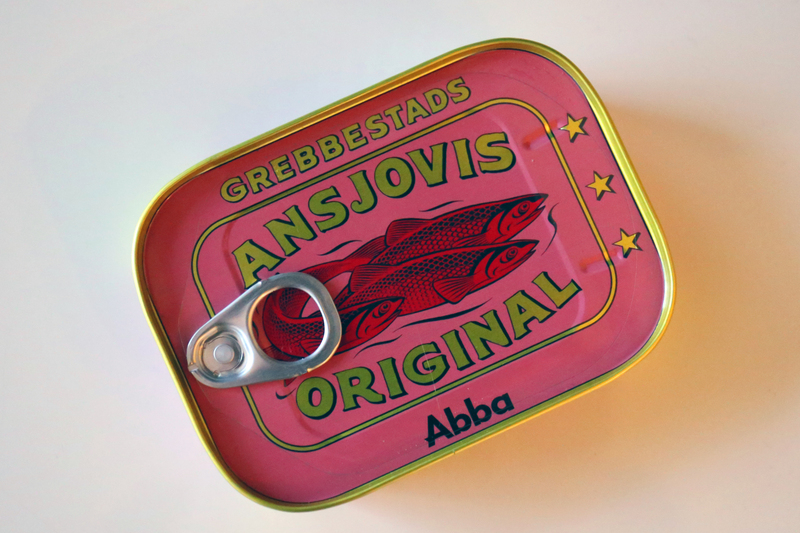 The fish used for Janssons are called ansjovis in Swedish which is often mistranslated into anchovies. Ansjovis are actually pickled sprats that have a sweeter, milder taste than anchovies, but you can use the latter in a pinch. A good Jansson’s has evenly cut potatoes layered with onions and ansjovis, all bathed in cream, and baked until soft with a crispy, golden top. The sweet fish combined with the cream and onions makes for a unique and interesting combination that may find its way into the hearts of your family too. Preheat the oven to 430°F(225°C). Fry the onion until soft in 1 tablespoon of butter. Do not let the onions brown. Butter a 9×14 (3.3 liter) casserole dish, and put a single layer of potatoes in the bottom. 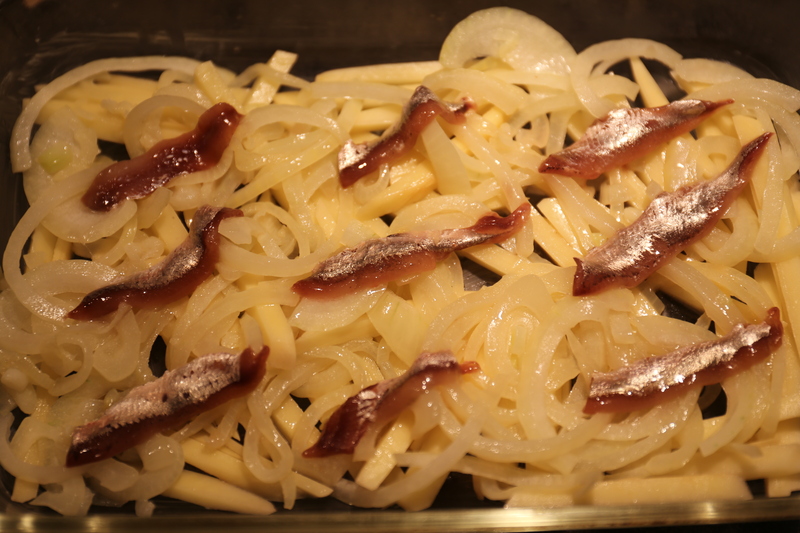 Add the onions, a layer of ansjovis (see image above), and the remaining potatoes. Pour over half of the cream, sprinkle with bread crumbs, and dot with remaining 2 tablespoons butter. Bake uncovered in the middle of the oven for 25 minutes. Pour over the rest of the cream, and bake an additional 20-30 minutes uncovered until the potatoes are soft and the top is golden. Serve hot. I have to confess that now after eating it for 5 days in a row (after making it myself and having it for Christmas lunch at work twice) I am done with it until 2014! What a coincidence, or perhaps it’s commonplace, but my daughter and her husband served it at midnight as the supper snack at their Stockholm wedding celebration this August. The substitute would just be regular anchovies, which are definitely more salty than the Swedish sprats, but will work. So good a casserole. Even my Midwest US MIL who wrinkles her nose at the mere thought of “them little fishes” had seconds, and dug in with relish. Thanks for the recipe! I used the salted (and rinsed) anchovies from the big can. Totally yummy! In the original Jansson’s recipe you put the ingredients in the oven for 10 minutes BEFORE adding the cream. That is the part that gives Jansson’s the classic crispy surface. There are certainly different ways to do it. The recipe in Vår Kok Bok calls for adding half of the cream at the beginning and half at the end. Like meatballs, each family probably has their own version and way of doing Jansson’s starting without cream would be interesting to try. My husband is a Sweden Finn, his parents are Finnish and moved to Sweden during the years after WWII. I’m an American Finn, though I do have roots from Northern Sweden, albiet when they drew the line that separated Finland from Sweden there were more Finns than Swedes in the North of Sweden, but also more gold and ore and silver and other minerals, and Sweden had a lot more power in the game. But I digress….as much as Nordic food has always been a part of my life, Jansson’s was never in the equation until I married the man from Sweden. I have to admit, my dad loves the stuff and we bring it every Christmas and it is now a part of our family tradition. There is a Scandinavian store in Minneapolis that carries all the assorted Scandinavian delicacies, and so we buy the sprats there. And my recipe never had me julienne the potatoes, will have to try that and see how it tastes!